As most of you know, we are ultra geeks and our family is in love with Star Wars. We are attending this year’s Star Wars Celebration in Anaheim, CA in about a week and a half and while the family plays, I will be working. If you can really call it WORK…. I will be acting as press for both The Cautious Mom and for Forbidden Panel, collecting awesome photos, interviews and experiences to share with everyone here and on forbiddenpanel.com. Recently I was contacted and asked to encourage readers to check out this amazing opportunity, so here it is! 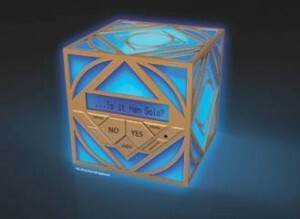 Go to the 20 Q website and play the Star Wars 20 questions game. It’s that easy! Share your knowledge to help create the Star Wars Holocron toy’s artificial intelligence! -That’s right, a piece of YOUR BRAIN could help create an AI toy. You will live forever in the form of your mighty brain full of geek wisdom!